Smartphones usage among visually impaired users is growing in prominence and mobile phone providers are continuously looking for solutions to make touch screen interfaces more accessible to them. Key accessibility features for vision related impairment includes assistive screen reading applications like Voiceover (https://www.apple.com/ in/accessibility/ios/voiceover/) in iOS or Talkback (https://support.google.com/accessibility/android/answer/6007100?hl=en) in Android which supports a variety of touch gestures for performing basic functions and commands. Our preliminary interactions with users from this community revealed that some of these existing gestures are ambiguous, difficult to perform, non-intuitive and have accuracy and detection issues. Moreover there is lack of understanding regarding usage of these accessibility features and existing gestures. 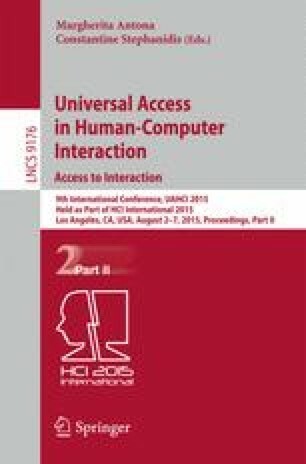 In this paper, we address these challenges through set of three experimental exercises-task based comparative evaluation, gesture elicitation and gesture performance done with a group of 12 visually impaired users. Based on experimental evidences we pinpoint the exact problems with few existing gestures. Additionally, this work contributes in identifying some characteristics of effective and easy gestures for the target segment. We also propose design solutions to resolve users pain points and discuss some touch screen accessibility design guidelines keeping in mind different type of visually impaired users - fully blind, extremely low vision and low vision.